"How much more would it be worth restored? Well, some people might pay more if you just left it as is, in its original condition. Every ding is part of its story, it's history. I once asked Dr. Ding to fix the only ding in one of my vintage Bings and he said I should leave it cuz it might be where David Nuuhiwa dropped his can of beer. Cool! You never know." The full post is over on the big forum site. It's true, you never know unless you can ask at least! Some are like scars from childhood adventures: a mark on the dining room table where my dad put a hot sparkler when he was a kid. Those buckle-rash scratches on that guitar I bought used: wonder what happened there? What stories do you have? 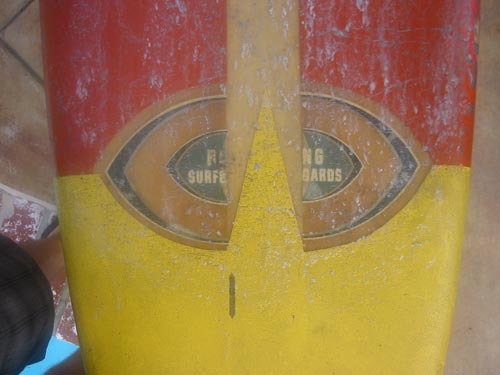 In the next few weeks, I'll put a few posts together about my surfboards and the stories behind each one.